Good recent rainfall has finally seen some significant flows in the Seven Creeks. Even the weir at Polly McQuin’s is spilling over the entire wall. Strathbogie township has received 113 mm so far in June and May wasn’t too bad either (130 mm). Mind you, had Polly’s been built in 1917, it would have looked a bit different. 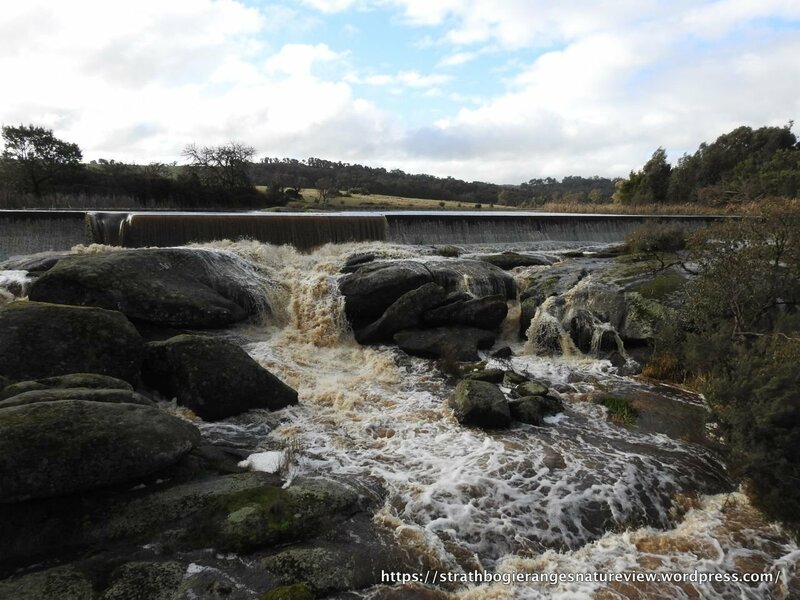 That year, Strathbogie had its wettest June on record, a total of 321! Some pics of the weir wall at Polly McQuinn’s, taken from on and near the bridge. Click on a pic to enlarge. And now some pics of the Bridge to Bridge Reserve and walking track (though you’ll need gum-boots!). The creek next to the picnic area. Parts of the Bridge to bridge walking track well under water. We think of this part of the reserve as a floodplain for good reason. Even with this minor flood, our boardwalk is impassable. The creek almost bursting it’s banks at this point. Channel depth about 2-3 m at this point and flowing swiftly. Here the walking path is wee submerged.